Even though Dan and I always talked about having four babies, I was never sure it would actually happen. We left quite a big gap between my daughter and our third baby Ayden; mostly because of work and just general life stuff getting in the way. But after he was born, I never felt done. Most of my friends with three children said that after the third they knew their family was complete. I never felt that. As thrilled as I was to have my three beautiful children, there was still a little nagging feeling that I wasn't quite finished having babies. Maybe I'm the kind of person who will always feel that way. Eternally broody. Well, if that's the case I'll have to learn to ignore it, as number four will most definitely be our last. So, here I go again. So very blessed to be experiencing pregnancy for the fourth and final time. I predict it'll be an emotional one; experiencing all my last pregnancy moments and milestones. I never documented my pregnancies before, which is something I really regret. I was even useless at filling in those pregnancy diaries. This time, I'm going to document every last bit - and try to remember and compare it to my other pregnancies too, so it'll almost be a memory of all four. I'm writing this at eight weeks pregnant, but won't publish it until I've had my scan and told family and friends. Once I've had the scan I'll start with real-time weekly updates. So, right now at eight weeks pregnant my symptoms are pretty typical of all my pregnancies; no actual sickness, but plenty of nausea throughout the day, mostly in the early evening though. I'm putting that down to being at my most tired and hungry at that time of the day. Speaking of tired... bloody hell, I'm exhausted! By 6pm all I want to do is face plant the bed. And some days I do. Just for ten minutes. It helps. Poor Dan is having to make do with the most unimaginative meals ever, cos I just don't have the energy or enthusiasm to make anything. At the moment, the baby is the size of a raspberry, measuring 1.6cm and weighing just 1g. How cute! I can't wait to have my scan in a few weeks, so I'll hopefully know that all is well and can start getting excited for the months ahead. 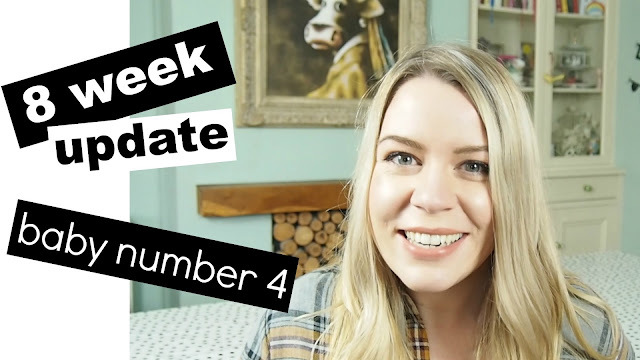 I talk about my early pregnancy signs, symptoms and cravings in a lot more detail in my eight week update video below if you'd like to know more. I'll post updates here and on my YouTube channel, so you can follow along in either or both of those places if you'd like to. And I'd love to hear your experiences too, so please do comment below and we can have a good old natter about baby bumps, all-day morning sickness and pickle cravings. Congratulations! Im on week 13 of my fourth pregnancy and your symptoms sound much like mine. I said during my third pregnancy "never again" but I felt that broody feeling at around 3 months post partum and we just went for it! But yes, number four will be the last as I'd like to do something with my life post babies! I am so interested to read your journey. I'd be terrified to have four, I am just so tired with three. Congratulations! How lovely to have 4, I would love to have another but I probably would get another set of twins! !